I have ordered the Blowfly and Butterfly coins from Shane. A representation of a part of the H.M.A.S. Warrego (I) and a part of the map of the world. The design includes a stylised representation of an arrow and a representation of 10 concentric circles emanating from a tower. The inscriptions ‘GERMAN NEW GUINEA 1914’, ‘50’ and the initials of the designer Wojciech Pietranic ‘WP’ are also included in the design. A representation of H.M.A.S Sydney (1912) in the upper sector, a horizontal line and an inverted representation of S.M.S. Emden (1908) in the lower sector. The design includes a vertical line, a stylised representation of the sea and a representation of a map of some of the Cocos (Keeling) Islands. The inscriptions ‘BATTLE OF COCOS ISLANDS 1914’, ‘HMAS SYDNEY’, ‘SMS EMDEN’, ‘96°50’E’, ‘12°10’S’, ‘50’ and the initials of the designer Wojciech Pietranic ‘WP’ are also included in the reverse design. A representation of a bomber. In the background, a central circle enclosing a stylised representations of bombs and a flag. Surrounding the central circle, a circular border containing a circle of dots, an ornamental design element, an arrowhead and the numbers ‘140’, ‘160’, ‘180’, ‘200’ and ‘220’. The design also includes the an ornamental horizontal line, inscriptions ‘G for GEORGE’, ‘FROM’, ‘1942’, ‘MISSIONS’, ‘90’, ‘TO’, ‘1944’, ‘ONE DOLLAR’ and the initials of the designer Aleksandra Stokic ‘AS’. there are a few silver coin releases, I would wonder if they would have them in normal $1 format too? A representation of a wasp nest containing eggs, a larva, pupae and a spider. 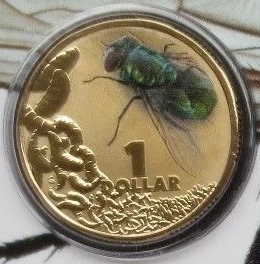 The design features a coloured image of a wasp and includes the inscription ‘1 DOLLAR’ and a stylised representation of the designer’s initials ‘AB’. The design features a coloured image of a beetle. The background contains a representation of a cross-section of a log containing a larva. Positioned over the log is a representation of two beetles fighting among soil and vegetation. The design includes the inscription ‘1 DOLLAR’ and a stylised representation of the designer’s initials ‘AB’. Current time: 26-04-2019, 12:11 AM Powered By MyBB, © 2002-2019 MyBB Group.